A monument commemorates those who died in service or were killed in action during World War One. 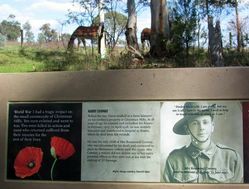 The memorial was renovated and new interpretive signage installed in 2015 with funding from the Australian Government’s Anzac Centenary Local Grants Program. A concrete obelisk with render made from local clay and lime-based mortar. of those who died in the First World War 1914 -18. 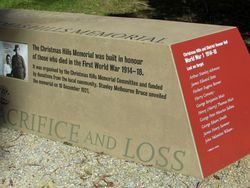 It was organised by the Christmas Hills Memorial Committee and funded by donations from the local community. Stanley Melbourne Bruce unveiled the memorial on 10 December 1921.